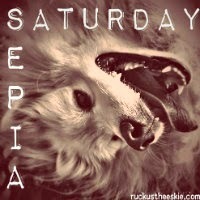 Ruckus the Eskie: Sepia Saturday #94: BOO! Get's what's around the corner? Sepia Saturday #94: BOO! Get's what's around the corner? A time of trick-o-treat, that's what! A little ghost with ears Ruckus!!! BOL!! We love it! We're so excited for the spooktacular fun to begin! BOL! You look too funny! Hee hee! So cute! It is creeping up on us, isn't it? Hope you get all kinds of good treats!! We can't believe how quickly it is coming! Looks like Ruckus ain't scared of no haints! Also, The contents are masterwork. you have performed a fantastic activity in this subject! If some one desires to be updated with newest technologies afterward he must be pay a visit this web page and be up to date daily. You're so cool! I do not suppose I've read through anything like this before. be tweeting this to my followers! Wonderful blog and outstanding style and design. Link exchange is nothing else but it is just placing the other person's website link on your page at suitable place and other person will also do similar for you. What i do not understood is in fact how you're now not really a lot more well-favored than you might be now. You're very intelligent. You realize thus significantly with regards to this matter, made me for my part imagine it from so many various angles. it and I have you book marked to check out new stuff on your blog. this twist of fate didn't happened in advance!